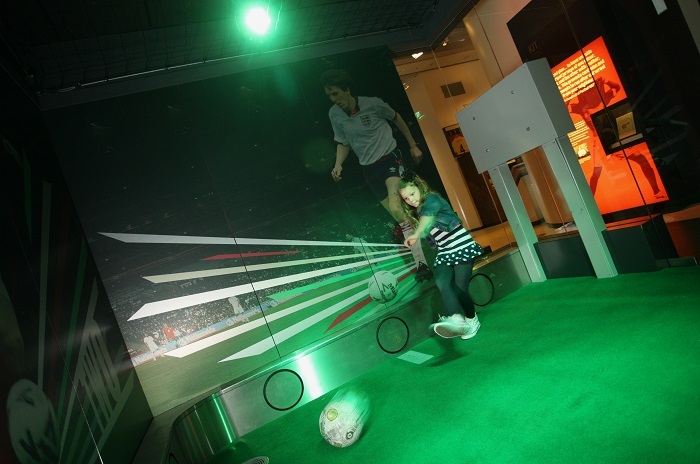 Make the most of your visit by trying our interactive games. Across the museum, there are seven great opportunities for you to test your skills at everything from showboating to commentating. Pick out the perfect ball with Pass Master: go for the big points but be careful, a misplaced pass will cost you points. Celebrate victory in the League Cup, FA Cup or Premier League when you Lift The Trophy, and take home the photo of you and the Cup. Please note that from January 2019, six of the seven interactive games will be included with the price of admission, with the exception of Penalty Shootout (£2 per three penalties). For more information about admission prices, please click here. We believe our interactive activities will be enjoyed most by ages 7 and over. If you’re going to play the games where balls need to be kicked, it’s best to wear flat shoes or trainers. Unfortunately we won’t let you play Penalty Shootout in high heels or barefoot. Purchase does not guarantee access to interactive attractions during our busiest periods. Museum staff will advise on likely waiting times and availability.